Yesterday’s move was not entirely surprising – Nauru houses Australia’s refugee concentration camps, which neither the local or Australian governments want the world to see. After the visa cancellations, the apparently-official @Republic_Nauru Twitter account tweeted: “Changes in visa policy implemented after ABC dishonestly entered country as tourist and failed to declare they were media.” The tweet, which the ABC says was wrong, was quickly deleted but later tweets maintained the accusation was true. There is no denying Nauru has an image problem, and the Nauruan and Australian governments do not like criticism of the horrible things which go on there. Journalists have (mostly) been banned from entering the country, and yesterday’s extraordinary measure to keep other potential witnesses out was met with contempt by those with compassion. First they had a North Korean style media blackout, now Nauru bans all Aust & NZ visitors… But, they still insist there’s nothing to hide. Talk about a touchy country. Or, maybe, a touchy PR company. 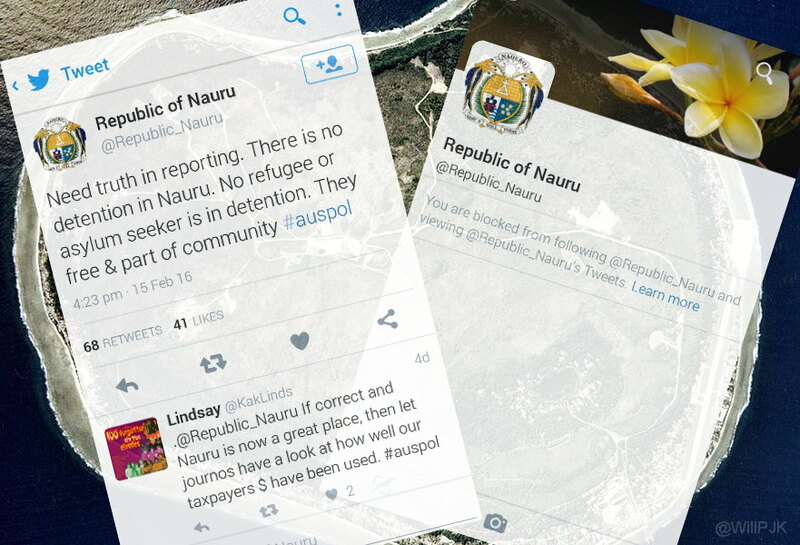 Brisbane-based Mercer PR oversees the Nauru’s account and responded in a similar way late last year after releasing, at the republic’s request, the name of a refugee allegedly raped on Nauru. Correction (21:45): I have been informed the Nauru account is managed by the country’s government and is not overseen by Mercer. I apologise for the error. Crisis PR is usually gentle, intended to smooth relations with those upset. It seems Nauru has radical new approach: accuse wildly and block like a 13 year old. Of course we cannot be sure who is in control of the Twitter ban hammer – a particularly keen Nauruan public servant might be clicking away right. now. – but deleting tweets and blocking critics it is never a good look.